Books, adventures, food, silliness and other things I love. Being a child of two nations I have always gotten to celebrate both American and British traditions (or, where conflicting, pick the best one!). For example I celebrate July 4th and St. George’s Day although I have learned that the British just aren’t as good at celebrating things as Americans are. I think I probably celebrate the British things in a very American way. 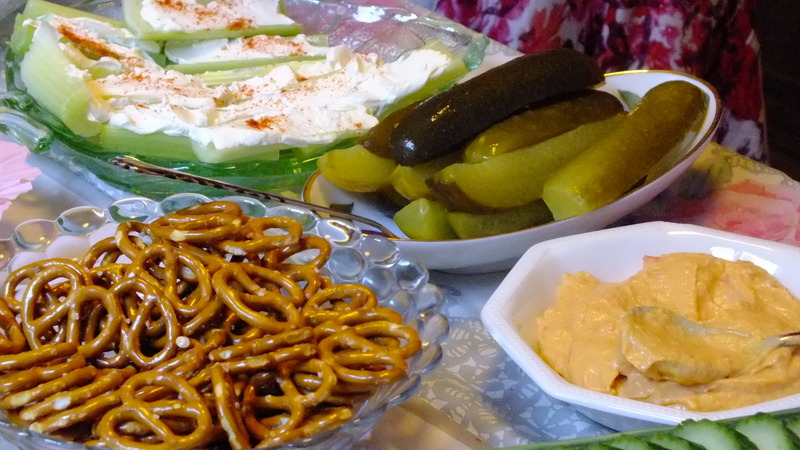 Last weekend was another example of this as my mother threw my an American style bridal shower. 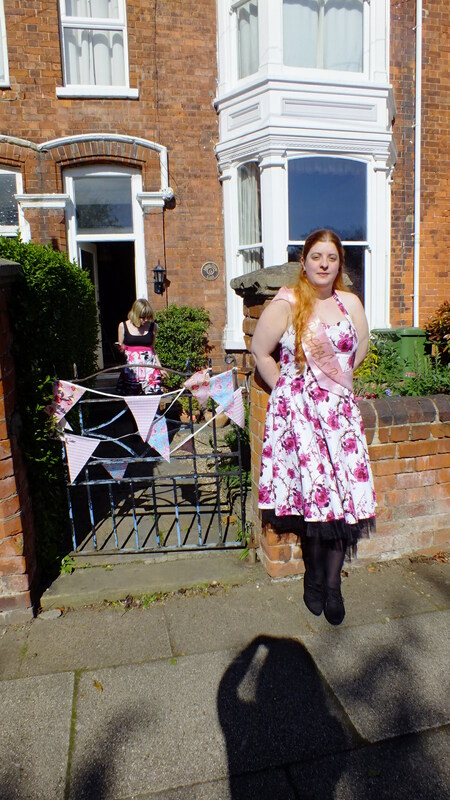 Next weekend my maid of honour is throwing me a hen party (I have no idea what style this will be since it is a surprise, all I know is that I need to wear clothes I can bend over in :s concerning). Last year when we were in the States we were going through a box of pictures and newspaper clippings my Grandma had and found a delightful article talking about a bridal shower she had been to which listed the ladies present, the games played and which lady won which game. It was beautifully quaint. The article also listed when the bride and groom would be honeymooning and their address… where all of their wedding presents would be… unattended. Different era. I think those clippings were from the late 1920s maybe early 30s. Mom decided to throw a 1950s style bridal shower for me but other than some foods and fashion changes it appears to be very similar. Certainly more civilised and pretty than a British Hen Party (or American Bachelorette party, I told my American aunt I was having a hen do and had to repeat it several times and explain before she stopped giving me a confused look). 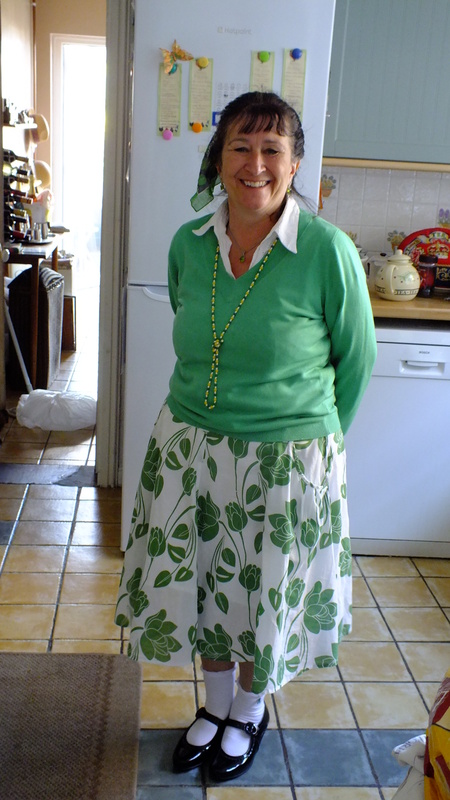 The first fun part was of course trying on lots and lots of clothes to find a suitable 1950s outfit. I ended up going with a dress I already had but the trying on is always a must. Chris got me the below a couple of years ago because the shape really suits me. And here comes Chloe in the background. Isn’t the bunting on the gate cute? This is the closest dress I had to a 1950s shape plus it is just plain cute. From Sohos in Afflecks if you want to know. My maid of honour Kim came across from Manchester with me and, as a guest in our house for the first time, helped make lunch. She had a genuinely vintage dress which was black lace over a bright pink, very cute. My sister also had pink and black so the three of us were unintentionally co-ordinated. Also in this picture our friend Annie, who also came as a guest, who also helped make lunch, bless them both! She also had a scarf in her hair and little bows on her socks, so cute! 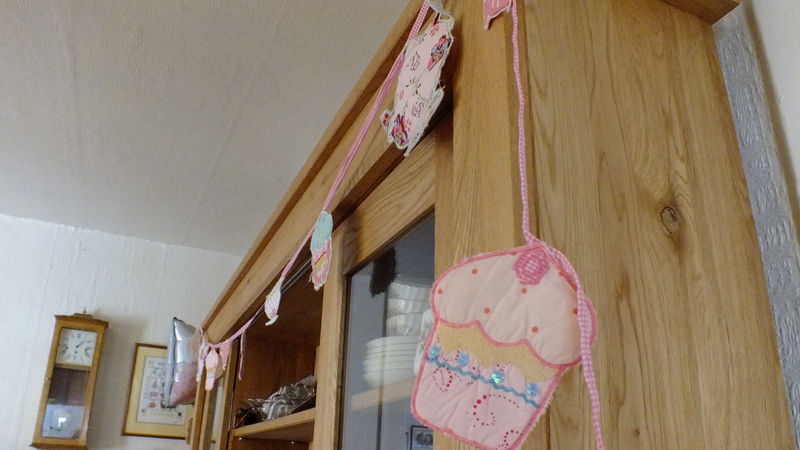 The house was decorated with lots of bunting and a pink and grey set of shower things that Mom had bought, it looked great. 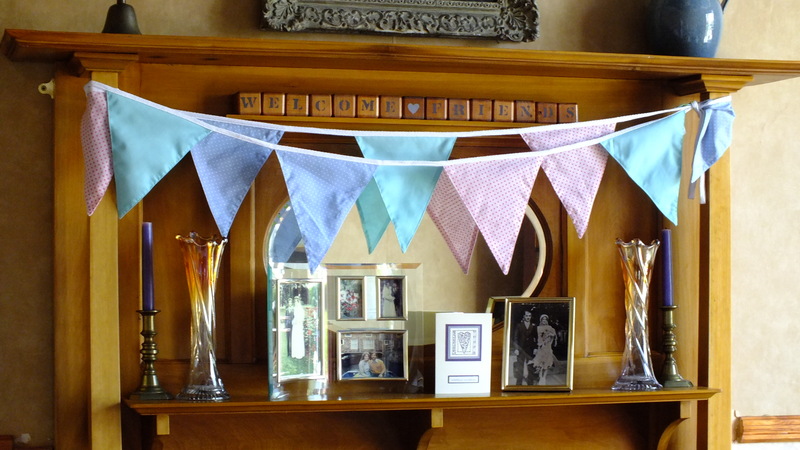 We got this bunting at the church Christmas fair. My mother thinks ahead! 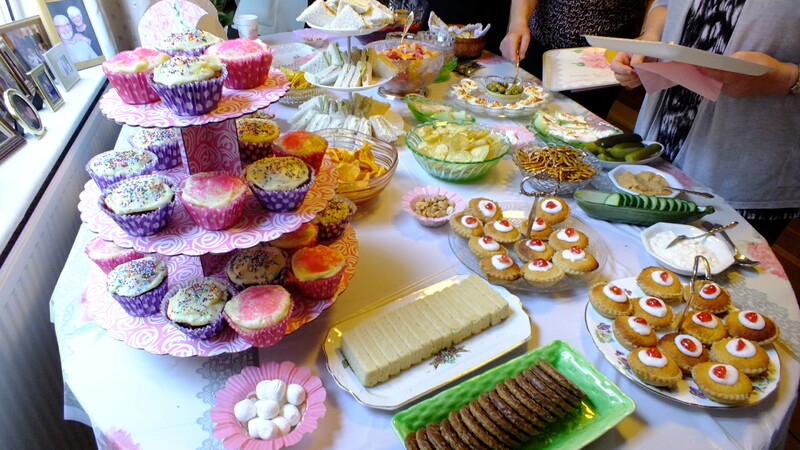 I had pink cup cake and teapots. I am sure we can use this again. This took some work to get it to stay up. Chris had to walk through Grimsby town centre carrying this and a bunch of purple stocks. He got some comments. The plates and cups also had this design. 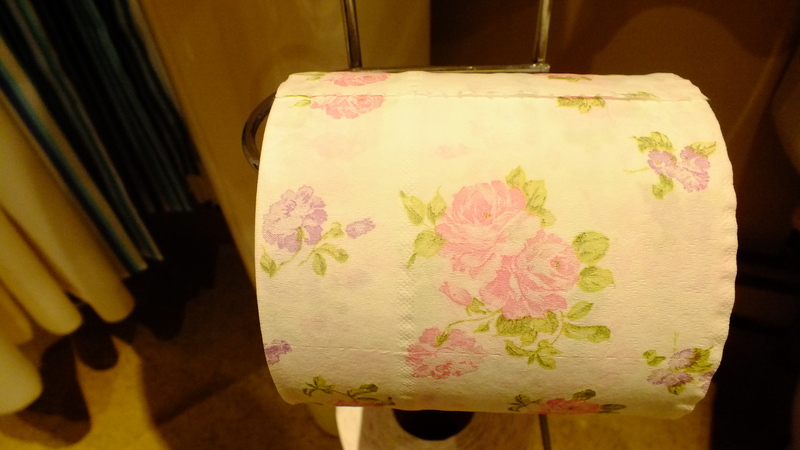 Mom even co-ordinated the toilet paper. 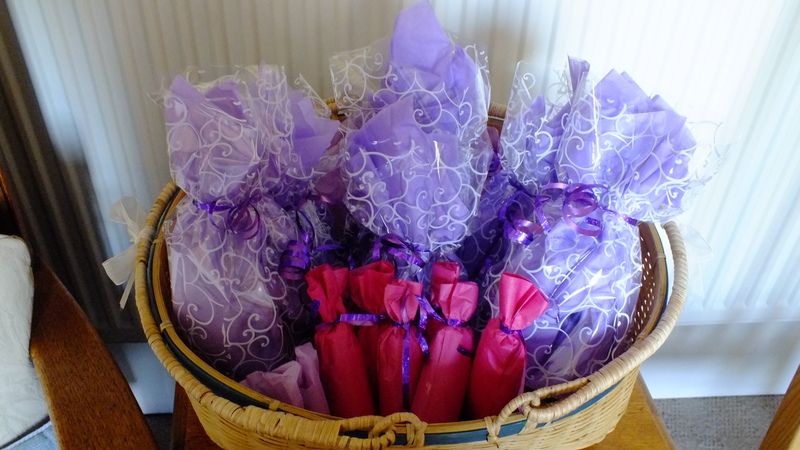 The lilac are the winners’ prizes with pink booby prizes. 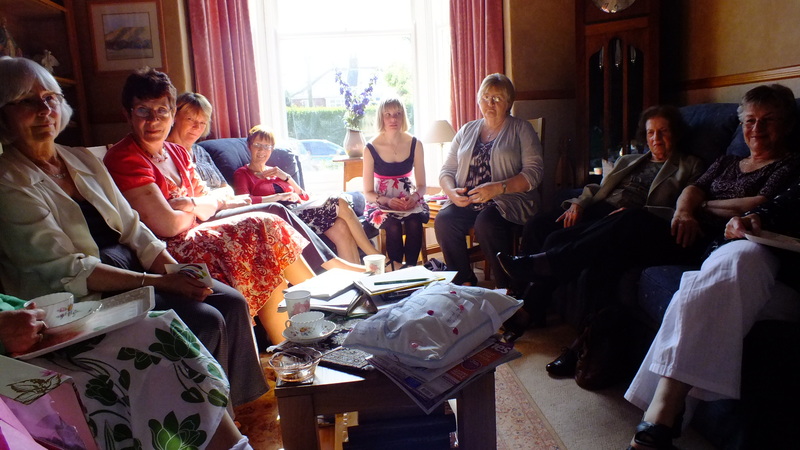 We just about all fit into our front room but I enjoyed the coziness, it meant you could see and speak to everyone. Mom had arranged several games for us to play, some just fun and others with a wedding theme. The first game was not bridal specific but fun, we had to match the pseudonym (wow I got the spelling correct first time!) with the real name. I discovered that I am better at men’s names than women’s and we had a laugh trying to pronounce some of the original names, no wonder celebrities change them sometimes! Next we had a wordsearch of wedding related words. This was ongoing during gaps between the other games. Overall I did ok at this but did manage to find some words that were not on the list but should have been such as ‘Wed’. I also think most brides will agree that ‘Fat’ is something that preoccupies them for months before the wedding! Next was a game that was definitely biased towards the happily already married as it involved matching wedding anniversaries to the present for it e.g. 1st paper, 25th silver, 50th gold etc… Apparently electrical appliances is now an anniversary thing. I want to know what got bumped off the list to make way for that! As unwed ladies Kim and I were hopelessly confused by this but now I know what Chris needs to be buying me each year! The next would be a fun game for any party: a list of things such as ‘types of flower’ or ‘cities’ down the left hand side and a name across the top (you may use your own, you don’t have to use mine like we did). People then have to try and think of an example from the left hand column which starts with the letter from the top. So for RACHEL you could have Rhododendron, Apple blossom, Carnations, Heliotrope, Evening primrose and Lilac for flowers. If no one else in the room has the same item in any given box you get a point. Of course I can think of them now, at the time I had a mind blank! Lastly we had a brief game of Mr and Mrs. Everyone got a number and whoever had the number correlating my final score won. Chris and I got 9/15 which isn’t bad. One question neither of us knew the answer to so I don’t count that one! I got a couple wrong and he got a couple wrong *cough* date he proposed *cough*. He’ll never live that one down! But it was a laugh. 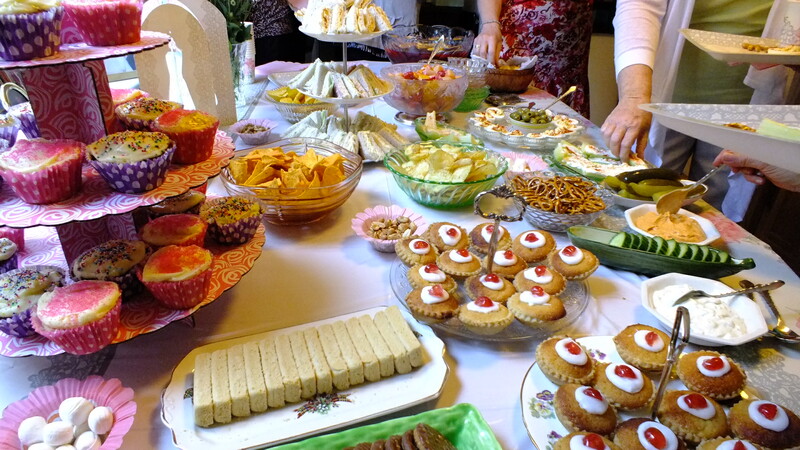 Following the playing of games and the winning of prizes we had a lovely buffet prepared by my Mom, Kim and Annie. Mom made red velvet cupcakes and lemon cupcakes. The lemon were a trial run for the weddng cake. Both were fantastic! 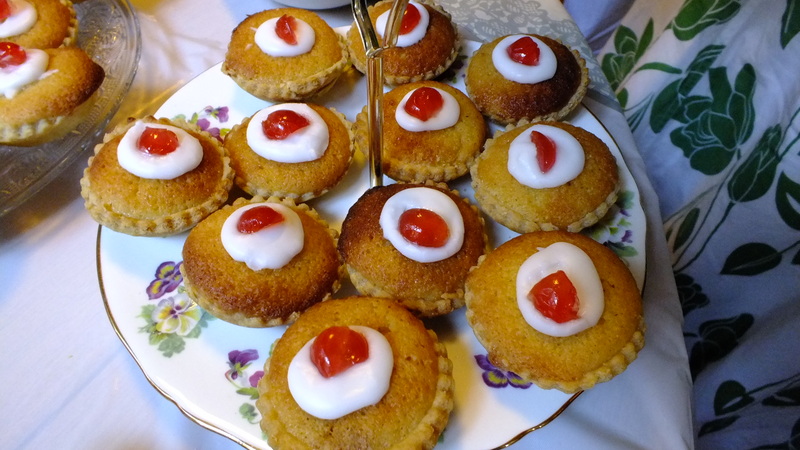 One of our guests made some truly delicious bakewell cupcakes, yummy! 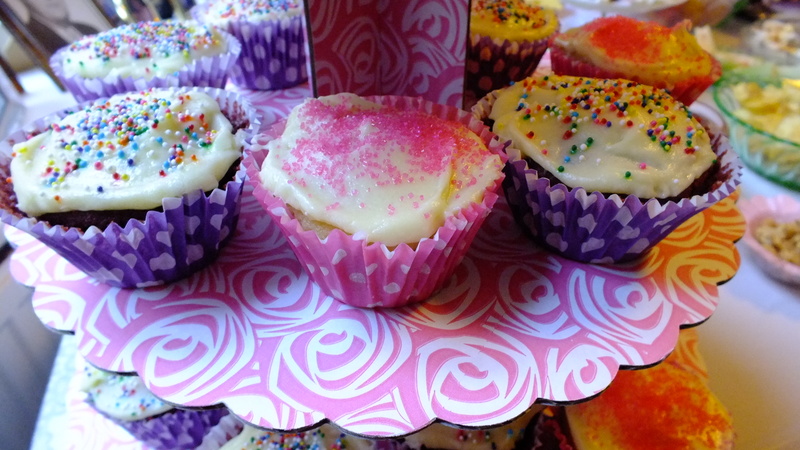 The lemon cupcakes are pink, the red velvet are purple. 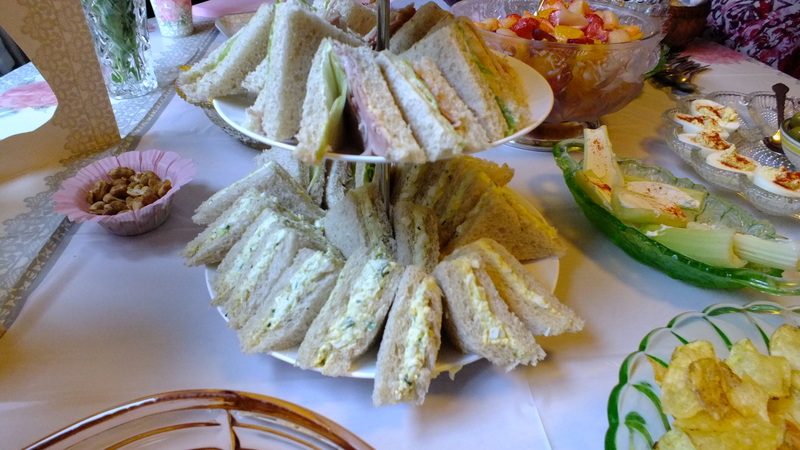 Egg and cress, ham salad or cheese and mango chutney sandwiches. 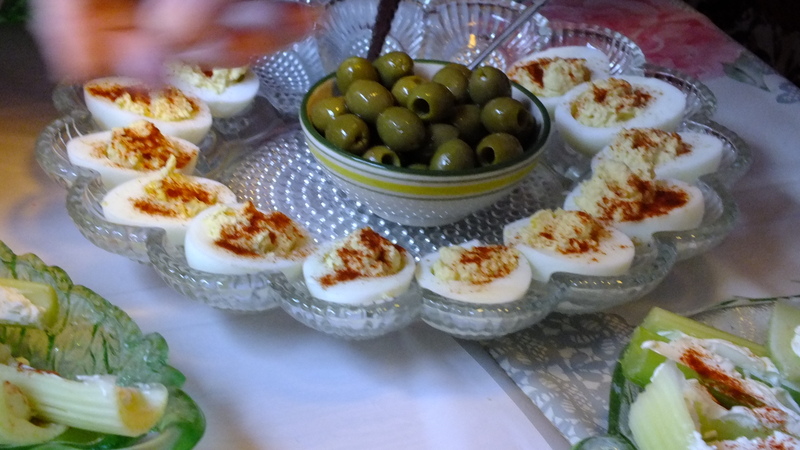 Devilled eggs. Apparently a must for this era’s parties. 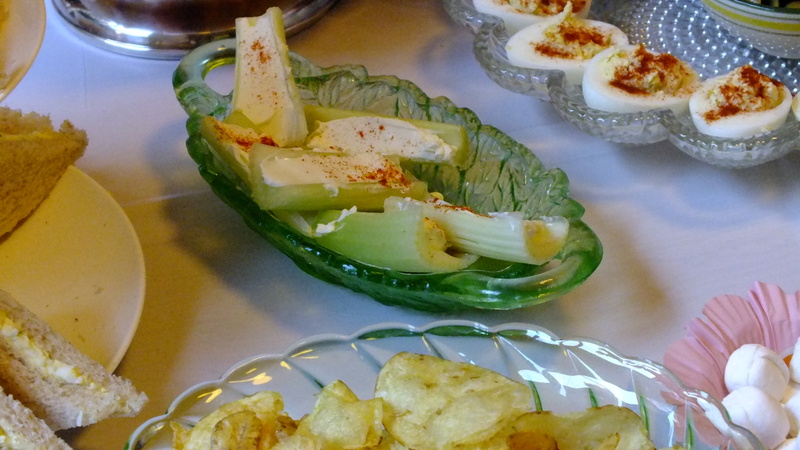 Celery with cream cheese. Can you tell my foodie best friend had the camera? Pretzels are of course and American favourite. I learned that Doritos were the new big thing in the 50s-60s. Look at that delicious feast. 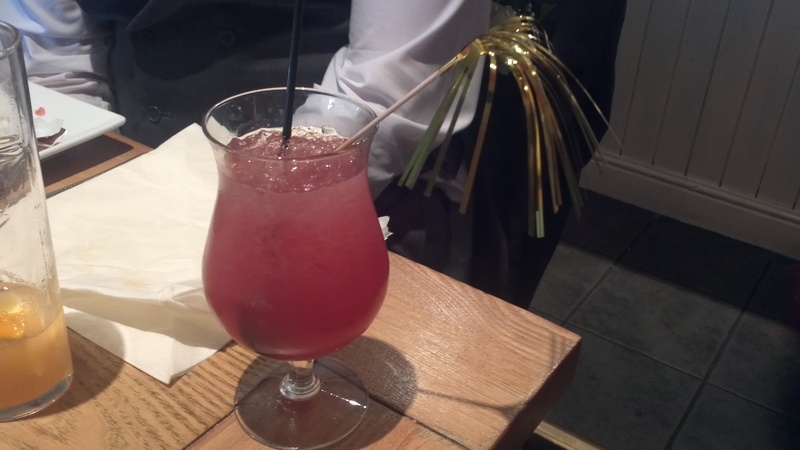 We also had a fruit (non-alcoholic) punch. After much eating and much chatting I opened my gifts. 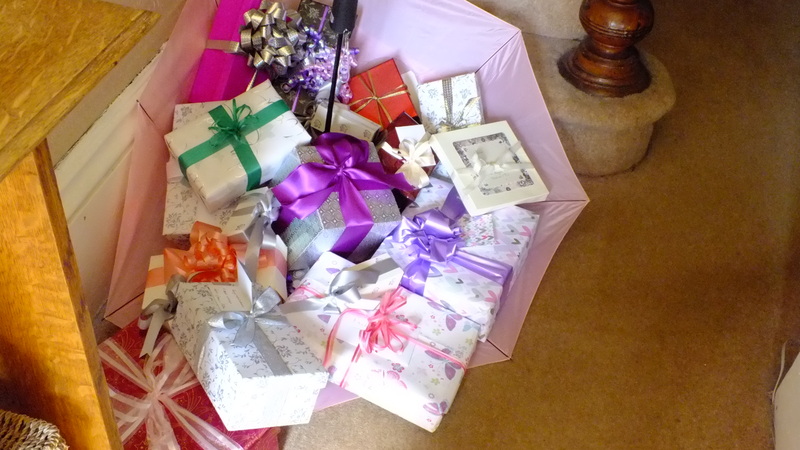 Mom displayed my gifts in an umbrella in the entrance hall. 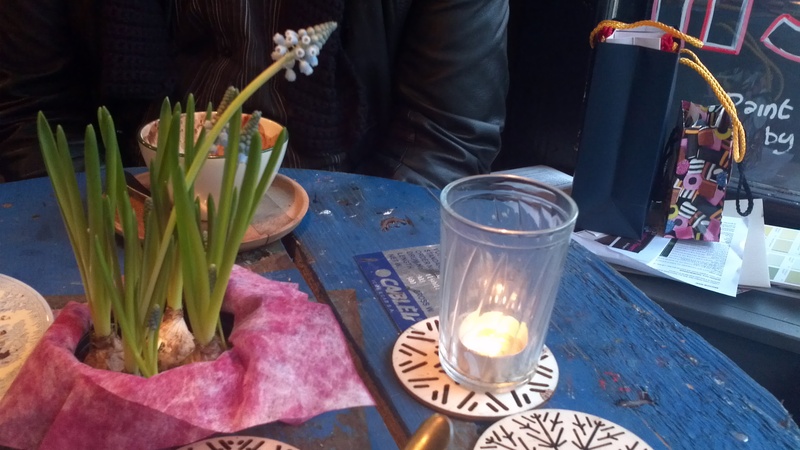 A great idea especially when you have run out of table space. Mom said they used to have three showers, one from the Mother of the Bride, one from the Mother of the Groom and one from the Maid of Honour. There would be different kinds of showers such as personal showers or showers where people bought specifically kitchen or house gifts. Since Chris and I already have a house which is pretty well equipped I had a personal shower. Gifts are supposed to just be very small, inexpensive things but I have to say that some of our guests did go a little overboard. I’m not complaining, I got some wonderful things. 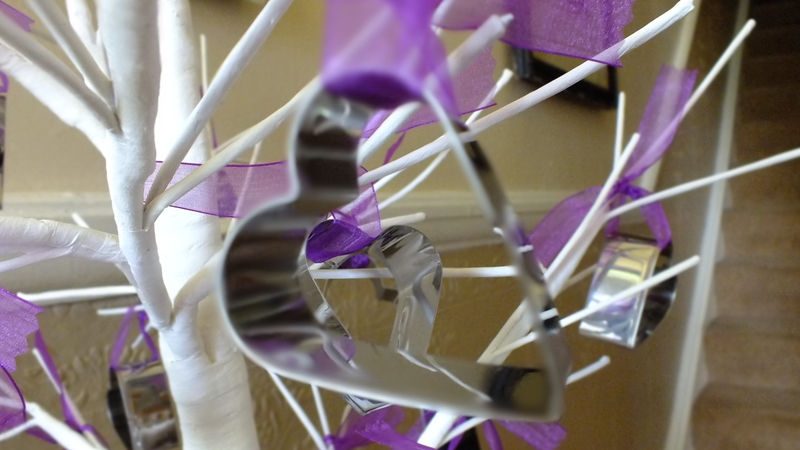 Some designed to help a stressful bride relax such as bubblebath, cream soaks and even a book ‘keep calm for brides’. Also a book ‘don’ts for wives’ which was a very short volume! Kim gave me a very thoughtful gift of a memory box into which I promptly put some of things from my shower. All of the gifts had to have a ribbon on it. This had a dual purpose. The idea is that however many ribbons break as I remove them is how many children Chris and I will have. My Mom had wrapped her gifts oddly tightly! In the unwrapping process I ripped one ribbon and one broke completely in half so I guess that is two kids for us. 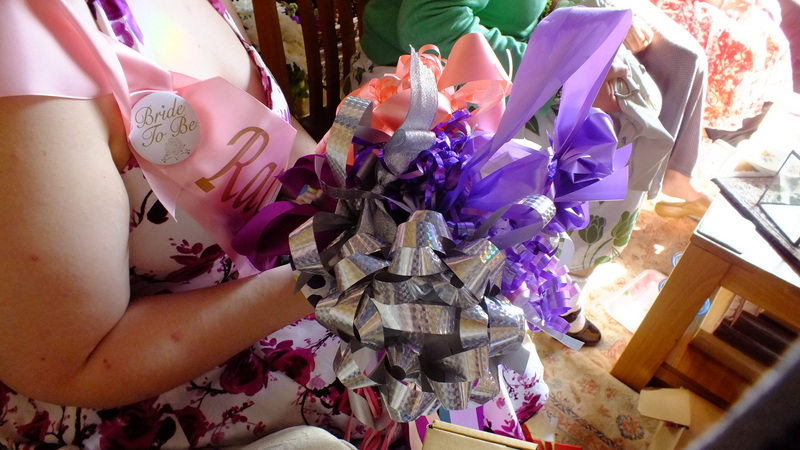 We then took the ribbons and pulled them through a paper plate to make a ‘bouquet’ that I can use for our rehearsal. I also got the gift of advice. Each lady wrote a piece of advise on a slip of white material which was then attached to a pillow which said ‘love’ via a heart shaped button. 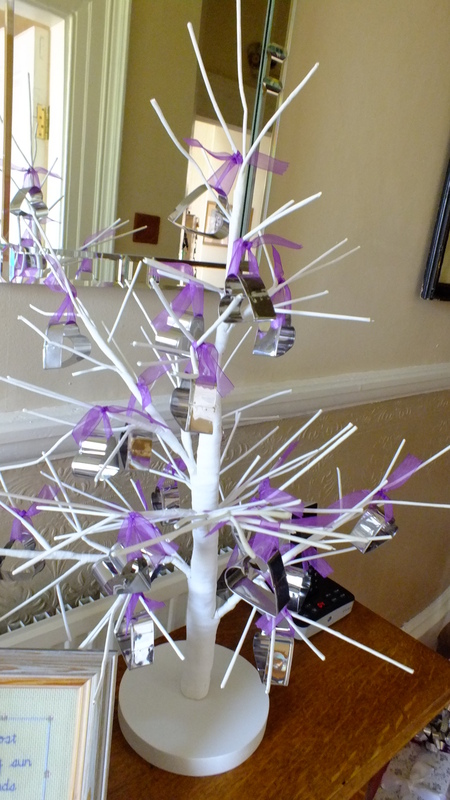 Before everyone left we had a little favour for them as well which my mother had hung on a tree in the hallway. 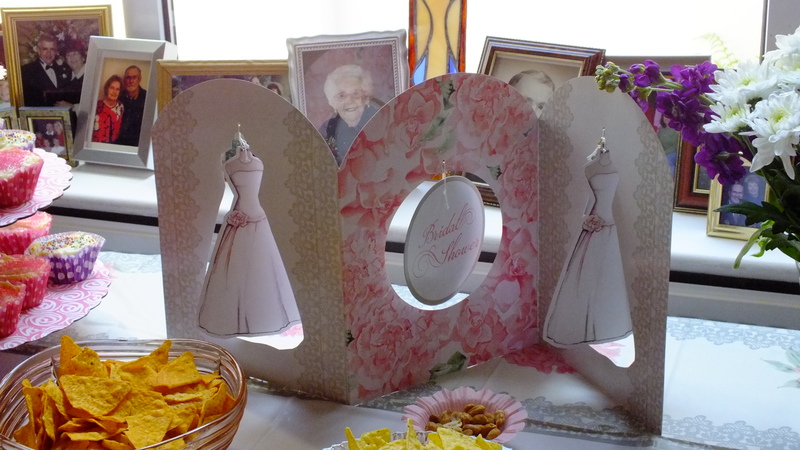 I want to thank Mom for throwing me such a beautiful and fun bridal shower, you’re the best. I also wish to thank Kim and Annie for helping us pull it off! Also all of the wonderful family and friends who came: thank you for the presents and thank you even more for coming over and making it such a lovely afternoon. 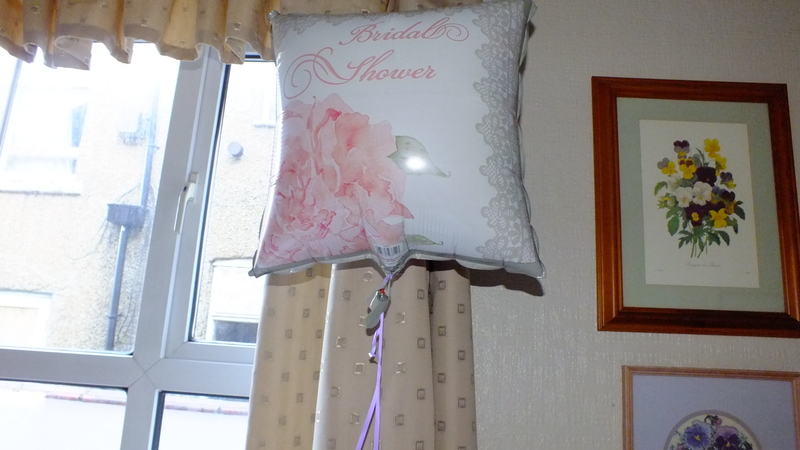 So on a closing note, if you are a bride-to-be, have a shower and a hen do. Two very different entertainments and both very worthwhile having! P.S. Always say ‘at the shower’ never ‘in the shower’. We learned this the difficult way. This post is a little late (read 3 weeks) due to a few health issues so please forgive me. 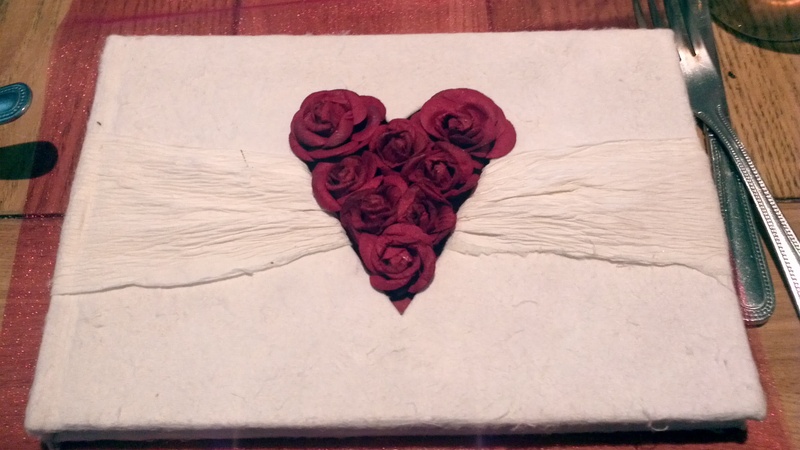 Now presenting… VALENTINE’S DAY! 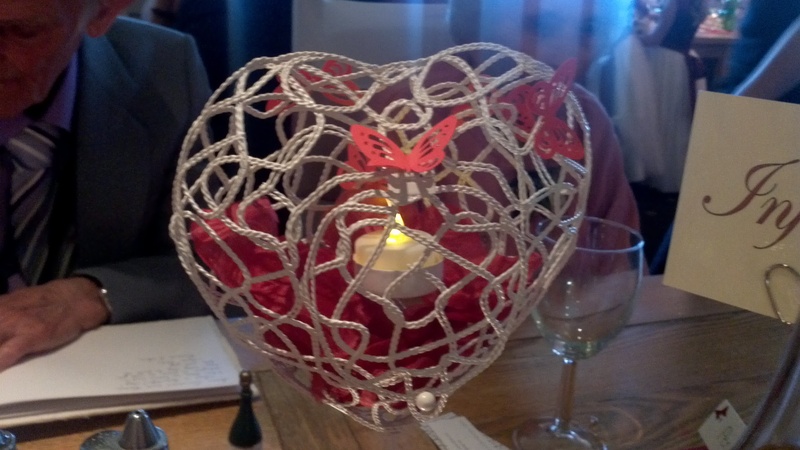 I am a complete romantic and fortunately for me my other half is as well and decided to take me out for a lovely meal… the day before Valentine’s day. We may be romantics but we are also practical and going out one day earlier is about half the price, gives more menu options and will have fewer crowds. Chris works on the opposite side of the Northern Quarter to our house so every day he has to trot down Oldham Road to get to the office. 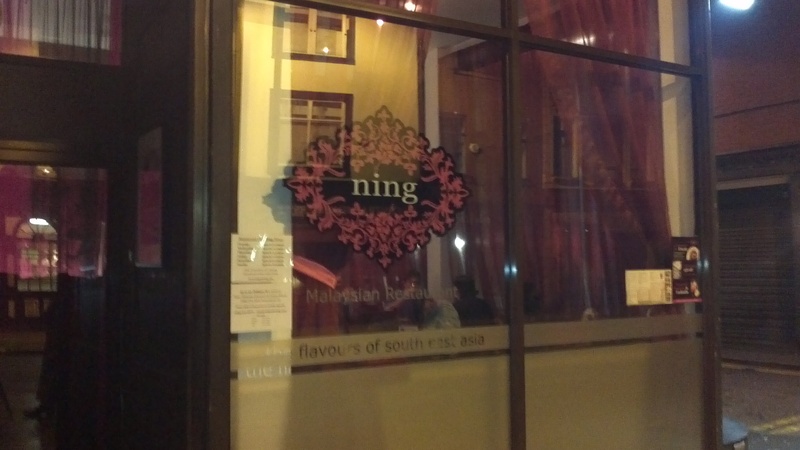 On the way he passes Ning, a Malaysian and Thai restaurant which always smells heavenly. After many weeks of saying we should go Valentine’s day seemed like the right occasion. 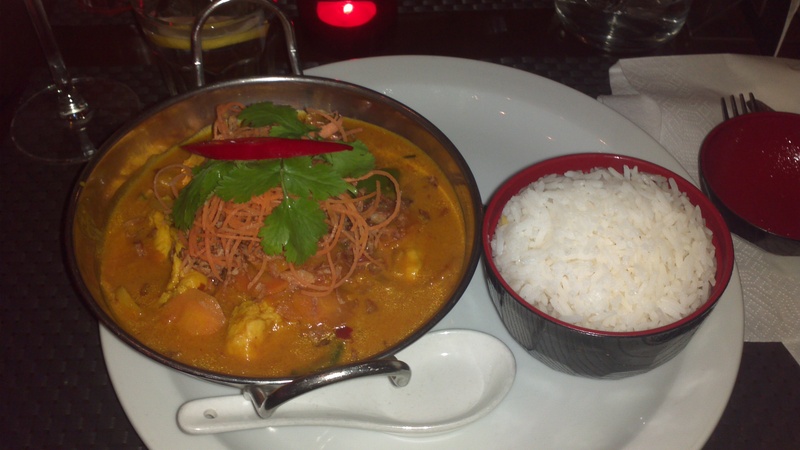 Since it won the 2012 Asian Curry Award for Best Malaysian Restaurant we figured it would be pretty good. Let’s just say that the award was well deserved! As well as smelling fantastic Ning always looks warm and inviting with long purple drapes and big lights. Since they have a 2 courses for £14.95 deal we decided to splash out and get starters as well as mains. 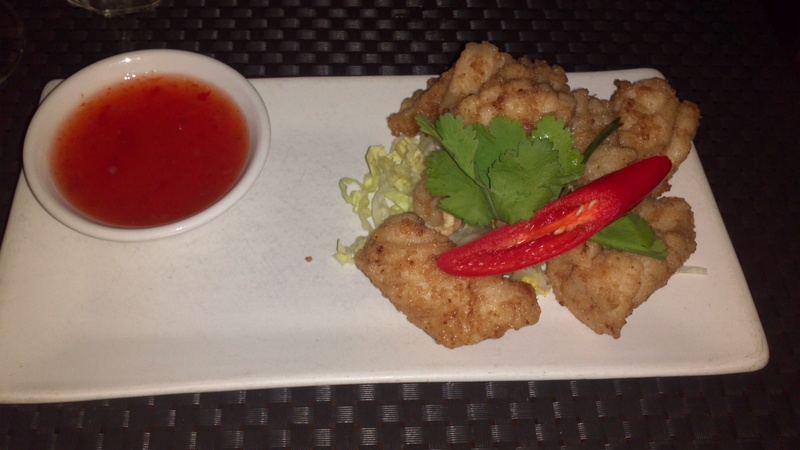 Chris started with Calamari with a sweet chilli sauce for dipping. Calamari is a new dish to Chris so he wanted to try it and thoroughly enjoyed it. He said the calamari was cooked well without getting to a rubbery stage and well flavoured while the chilli sauce was spicy without being overpowering. I have had calamari before and tried a piece and I have to say I agree. I don’t usually like anything from the ocean due having worked in fish factories too often but calamari is not too fishy. It just goes to show, it is always worth trying something! I decided to have the Masalodeh. 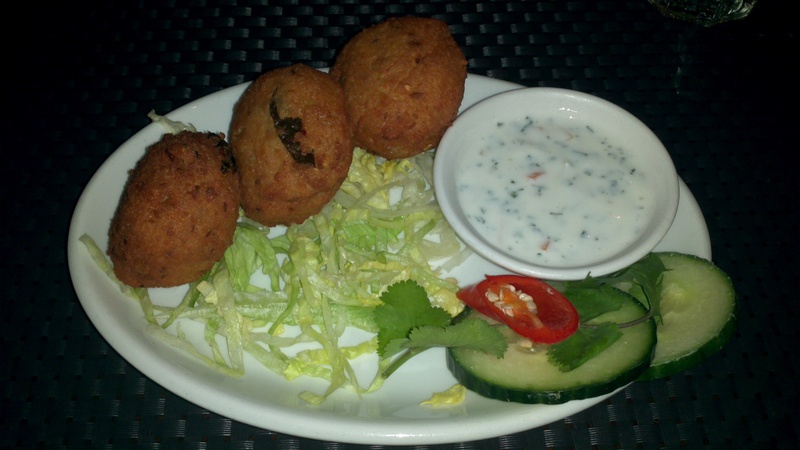 If, like me, you have no idea what this is without looking at the menu description it is as follows: “Delightful Indian-inspired lentil fritters made with onions, chillies, cumin & fresh curry leaves, servied with either a yogurt & mint (V) or sweet chilli dipping sauce (Ve)”. I had it with the yogurt and mint option but also had a quick dip in Chris’ sweet chilli and can confirm both work well. The fritters themselves were very solid (I had expected the crunchy surround to cave when I cut into it but the whole ball was full of yummy lentils) and just the right amount of spicy, warming without making you run for the milk. The yogurt complemented the drier fritters perfectly. I would definitely have this again. 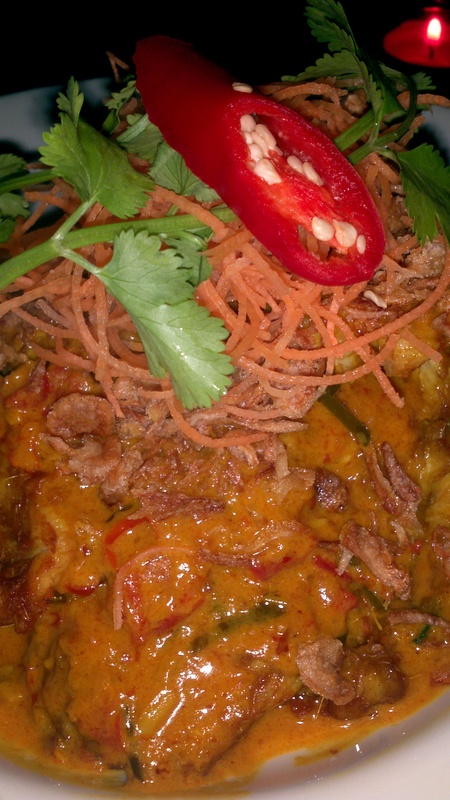 For mains Chris decided to have Nyonya Lime curry with chicken which he describes as “sweet, well spiced throughout and utterly gorgeous.” It comes in chicken, seaford or vegan. To accompany he had some egg friend rice which came in it’s own little container which I thought was rather cute. I opted for Ayam Percik: chargrilled, marinated chicken breast on a bed of spinich with the ‘chef’s special’ curry sauce. I figured if I am having Malaysian for the first time what better place to start than with a Malaysian and chef’s special? I was pleasantly surprised with the amount of chicken I got in mine, several large pieces! The chicken itself was tender and well flavoured. The spinich had been cooked perfectly and had just right amount of crispness still. The sauce, however, was fantastic: it was very sweet but not overpowering, the flavours were well proportioned for maximum taste, spicy enough to be warming but not enough to burn. Highly recommended. I had mine with jasmine sticky rice. Since it was (almost) Valentine’s day we opted for the alcoholic drinks. Both of us found drinks on the cocktail menu we had not previously tried and wanted to but will now definitely want to try again! 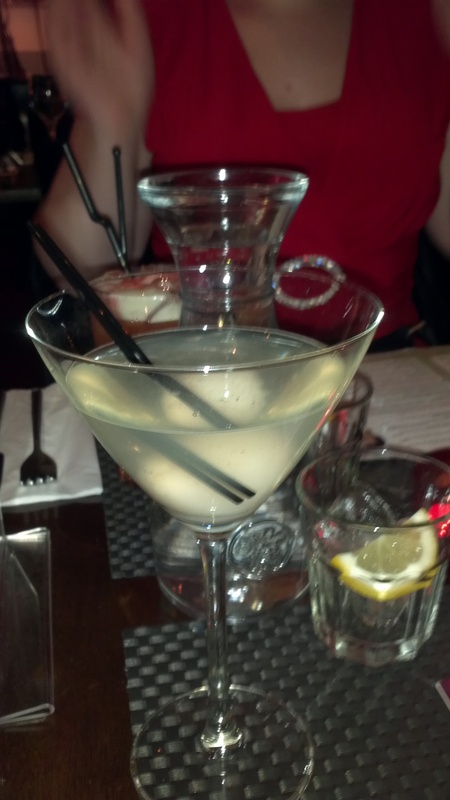 Chris had a lychee martini. At first I thought he had an egg martini :s. I have since learned that alcohol soaked lychees are delicious but have a similar texture to calamari. Quite odd. Mai Tai! I have always wanted to try one. 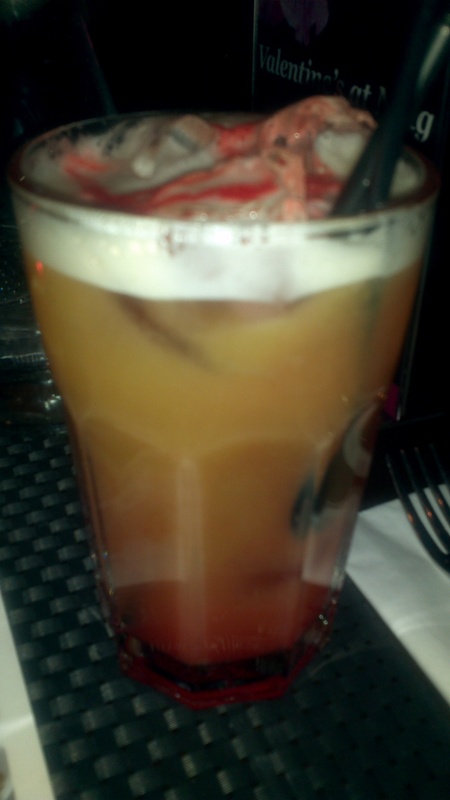 Light and dark rum with apricot brandy topped up with juice. I love fruit brandies. It is also pretty. We were so full after dinner we decided not to have dessert and went for a walk instead. 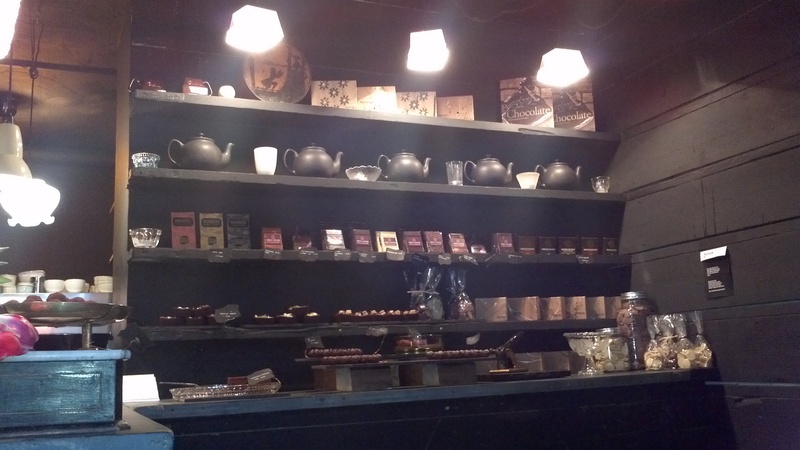 A whole two blocks to Home Sweet Home for a cup of tea night cap. Funnily enough while there we ran into Kim who was going to some sort of cheesecake meeting, of which she has yet to post pictures. We stuck to a plate of their famous cookies. A warm, homey way to end a warm, exotic night out. A couple of weekends ago Chris and I decided to have a bit of a treat and go to the new chocolate shop which has opened around the corner from our house. 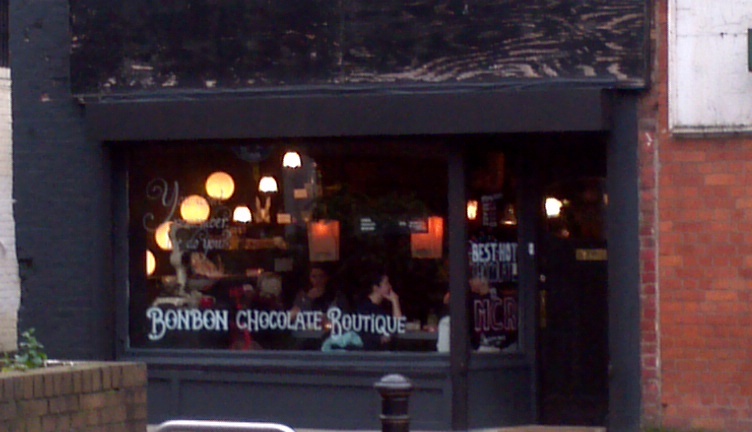 Largely because we keep walking passed it and it looks delicious!!! 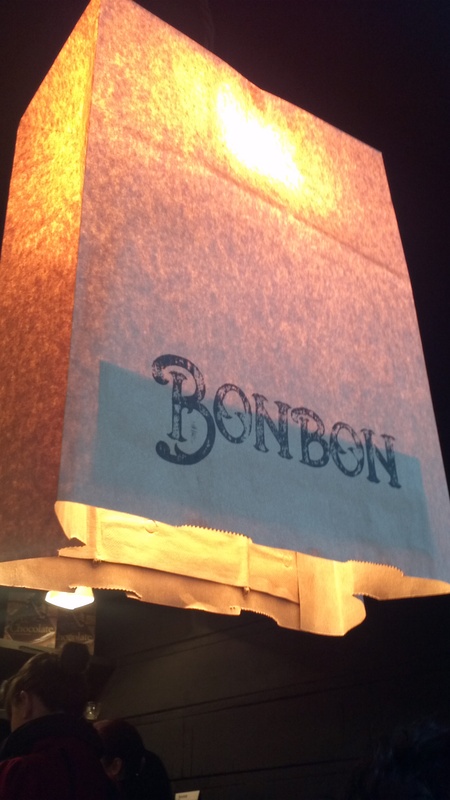 It is called Bonbon and it is chocolate boutique. How cool is that? I think we may have actually found heaven. Walking into a shop where they make all of their chocolates on site on a cold day definitely qualifies, I wish I could have photographed the smell, mmmmmm. This was the sign on the door so we thought we should do an independent verification. It just had to be done! After sampling I think the sign may be correct. 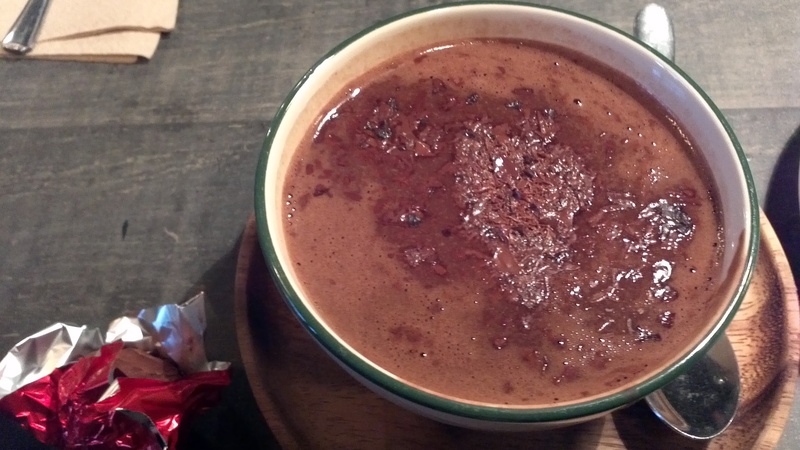 The hot chocolate, which comes in normal, orange, banana or salted caramel, was thick and fruity and utterly gorgeous. 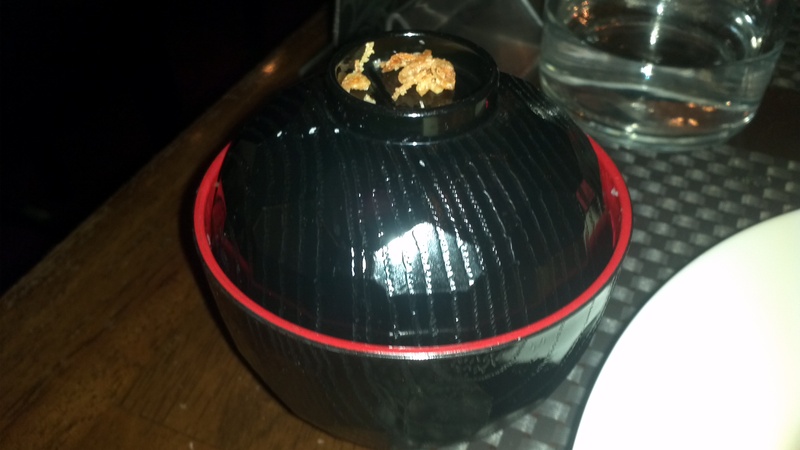 Served in cup sized bowls it was wonderful just to hold and sniff since my fingers were freezing cold. I went for the banana and Chris had orange. Basically it was a big cup of melted chocolate with just a little spring water to make it drinkable. Very rich! 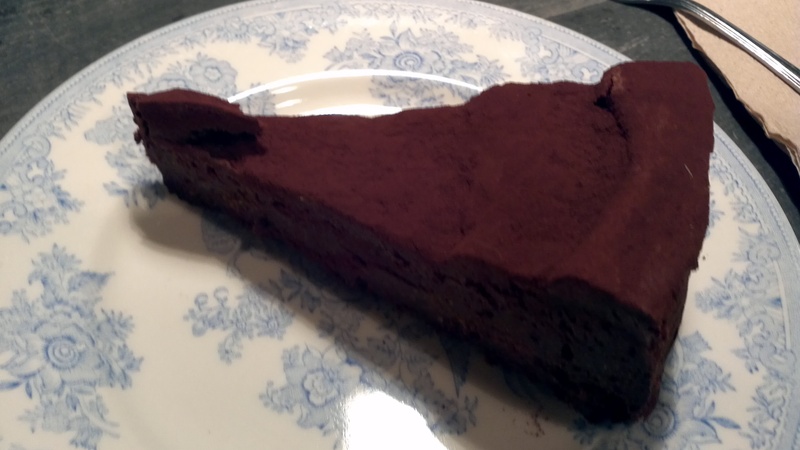 We also decided to splurge and split a piece of flourless chocolate torte (gluten free therefore Kim!). The hot choc and torte were so rich we couldn’t actually finish the one piece between us. While the store itself is very small and only has 2 tables it was still very charming and had a Northern Quarter independent vibe. 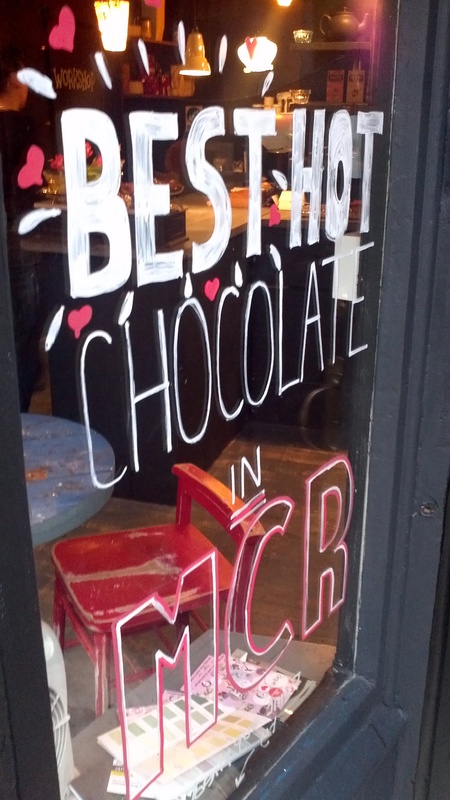 I liked the decor which was a mix of homemade and shelves and shelves of chocolate. The lady serving was also a Northern Quarter quirky kind of lady and was absolutely lovely, we had quite a nice chat while we were waiting for table to free up. While it is not cheap the quality of the chocolate definitely makes it worth it, especially if you are limiting your sweet intake and want a real treat. We each got one truffle to take home for later and they were literally melt-in-your-mouth fantastic, smooth and sweet. And look at all the choices! He also greatly enjoyed the sugar overload. The store seemed to be doing well while we were there and we hope it lasts. Completely charming, 10/10! So I have been a very poor poster recently but it has been incredibly busy between Thanksgiving and Christmas. I almost ran out of time to breathe. So here is a few of the highlights. And a New Year’s Resolution to do better. Emma and I went for high tea at Sugar Junction since I had a voucher and Emma has not had high tea before. I had a beef and horseradish sandwich and an egg mayo sandwich. The fillings were yummy but it was served in a bun which is not a good amendment to the high tea formula. 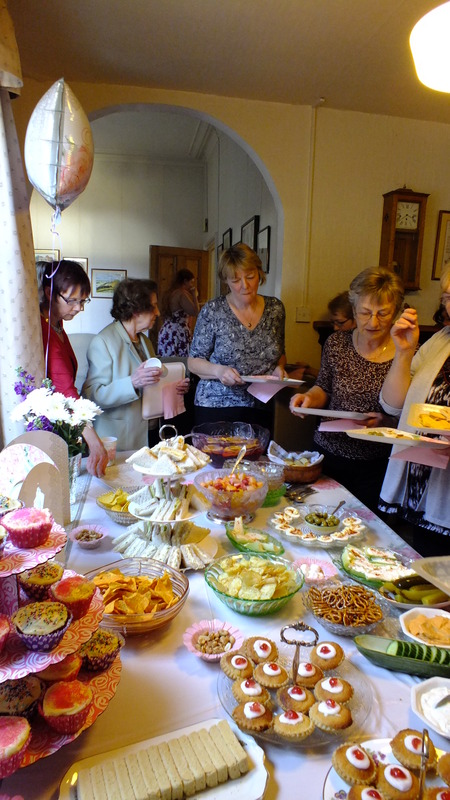 The scones were very good but the choices of sweets were strange with something pink and some kind of crumbly fudge. I did enjoy my Victoria Sponge and Bakewell slice though. The tea itself was, as always, delicious and I do love a china tea cup. Overall mixed reviews for Sugar Junction as always, another good for the price but not worth full price I think! Still, I hope Emma enjoyed it. One day she will have to come to mine and I will make her a traditional high tea. Then it was Thanksgiving. I forgot to take photos this year but it was much the same, foodwise, as last year so please look HERE. This year we had Chris’ parents over for Thanksgiving so that they could see the wedding venues. There was a Christmas fair in the church so Mom, Annie and I did a little shopping. While we were at it Mom and I practiced walking down the aisle. Mom and Annie at the church standing in the aisle. While we were home Chris and I also had a few wedding things to attend to. 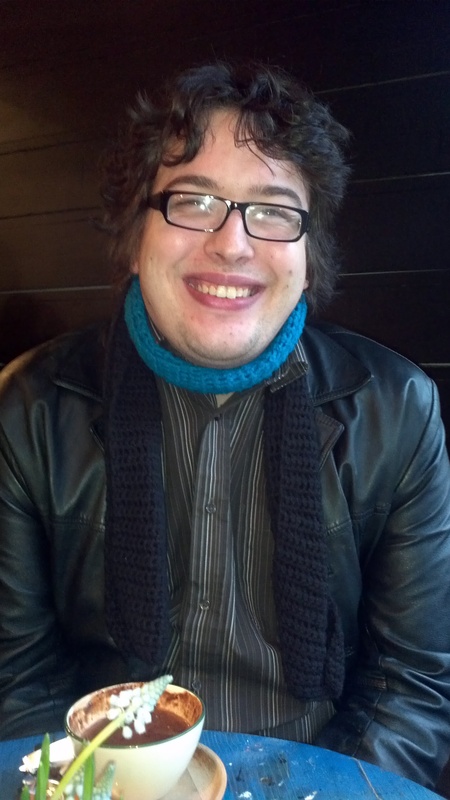 We had a meeting at the church to do the formal booking and form-filling-out after which Chris treated me to breakfast. And we also had a meeting with our Minister and another one with our photographer. After which Chris and I got venison burgers for lunch… see a pattern? There used to be a man who had a stall next to our house which sold venison, boar etc… until he closed down, so when we saw it at the Grimsby markets we could not resist. We also went for lunch at the reception venue, Laceby Manor Golf Club. Just as before the food was of a very high quality and in generous portions, this bodes well for my reception food! I had a chicken, leak and mushroom pie and Mom had chicken and mushroom stroganov. So you can see even just the Thanksgiving period was busy before we even got into Christmas stuff! Shortly after Thanksgiving my parents came over to Manchester to do a bit of Christmas shopping. We spent the day hitting the Manchester Christmas Markets. I got a few ideas of presents for Mom but sadly by the time I went back to get them for her one place had sold out and the second had disappeared entirely! Odd. After shopping the four of us went to Grinch for dinner. The food here was ok but not great. Mom had to send hers back to be reheated and they only had Pepsi, not coke. I also found the décor weird: some really awful modern art and a painting of a naked woman being the worst. So overall not a bad meal but not somewhere I would go again or recommend. A pity since I love the name. We did get some great cupcakes from the markets which we had for dessert. One was ‘cherry bakewell’ and the other was cinnamon. Chris and I both had staff dos. His was at Bluu Bar, a place which annoys me no end by being RED! With some diligent searching I found 2 things that were blue. We also had canapes that were not canapés but I have to say were very tasty. Meeting Chris’s staff was interesting… most of them seemed very nice… one or two of them seemed very drunk :p.
Then there was the weekend of the 2 Christmas dinners. I have had 4 Christmas dinners altogether (not as many as Chloe who even packed 2 into one day!). We had our work do at Bella Italia in the Arndale which is a place Kim and I often go to when we want something quick and close. I love Italian food. I had mushrooms for starters, Cannelloni for my main and a cheesecake for dessert. They were all delicious and I had a really good time out with my team. The next Christmas dinner was at Kim’s house. As you can see from the various Come Dine With Me posts (which we are starting again in the New Year… watch out for Chris’ curry coming up next!) we try and have sit down dinners with our partners when we can. As you may also notice we are terrible at arranging them! Kim went American style for her starter and main with buffalo wings for a starter (which I could eat a whole bowl full of), with homemade blue cheese sauce and pulled pork with jacket potatoes and red cabbage for the main. She did the pork as maple flavour which I personally prefer to the smoked type. For dessert we had a chocolate fondant with a salted caramel centre. Fondants are hard to get right but Kim’s came out perfectly, all hot and melty in the middle. Delicious! Please check out the recipes for these treats on her blog Full As An Egg. The next weekend was another weekend at my parents doing last minute Christmas organisation and baking (the second baking period this season). I stayed until Christmas Eve so that on the Sunday I could go to the Christmas Carol service at church where Mom and I did some excellent harmonising. On Christmas Eve morning we got up very early and went to the butchers which is a tradition for Dad and I.
I returned to Manchester on Christmas Eve and went straight to Chris’ parents where I spent Christmas Eve, Christmas Day and Boxing day. I had a great time hanging out with my soon to be in-laws who were all very welcoming. They also gave me some very cool gifts. We got up early on Christmas, opened presents and had bacon butties followed by Chris and I rushing out for Church. The church we went to was the same one that his parents got married in which was very cool and the sermon was interesting which was a bonus! Unfortunately we had to sing ‘In The Bleak Midwinter’, the only Christmas carol I really can’t stand. The only Christmas carol sung at every Christmas thing I have been to this year. After church we visited the Grandparents then went home for Christmas dinner. Steve, Chris’ Dad, cooked a great Christmas turkey with all the trimmings! Yum yum. Since Christmas things have not quieted down! This weekend my parents came over to give us our presents and we went out for a 4th Christmas dinner! Chris and I had passed a new restaurant near the Town Hall recently so we decided to go there. Avalanche I would recommend. 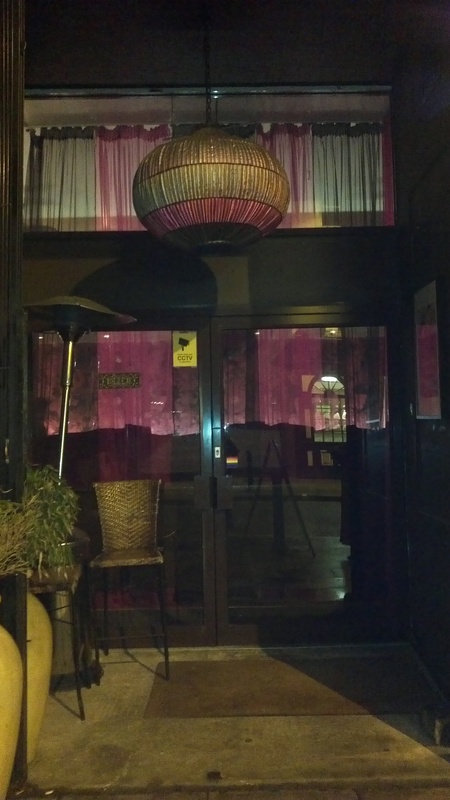 The service was exemplary, the food hot and tasty and the setting was very classy. While drinks were quite expensive the food itself was reasonably priced so Chris and I will definitely be going there again. These ‘icicles’ looked amazing and really reflected the light well. 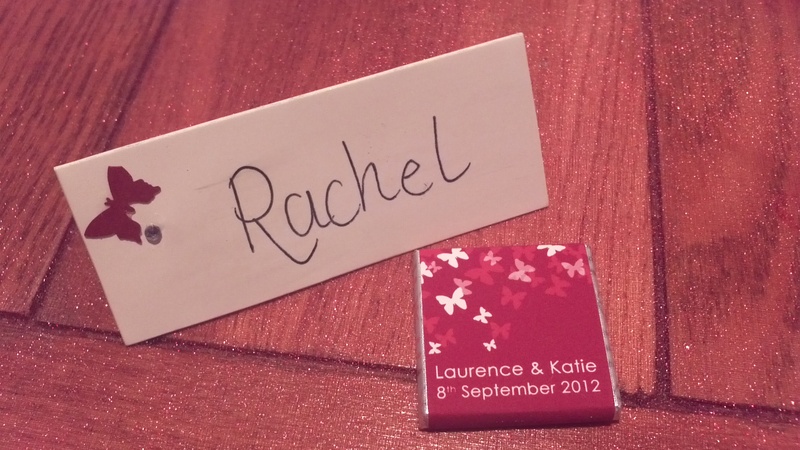 Last weekend was the wedding of my cousin Laurence and his lovely partner Katie. Katie has been in our family for a while now since she and Laurence have a very cute two year old son, Tristan, so it was great to see them tie the knot! 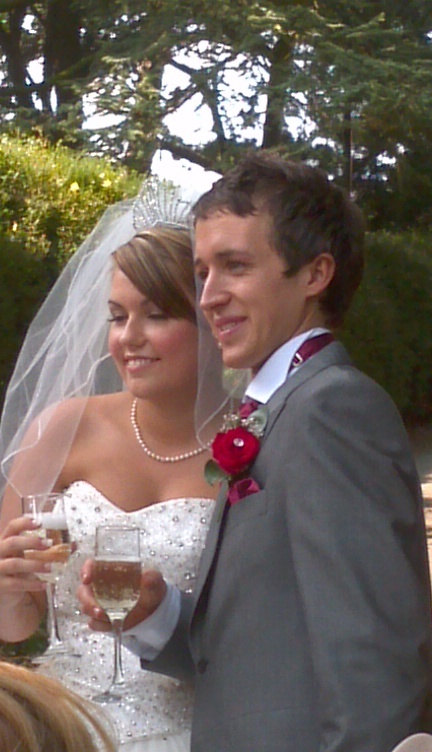 The wedding was held at Old Clee Church back home in Grimsby. They have some beautiful stain glass windows and it is suitably impressive for a bride to walk down the aisle. Even the pews weren’t too uncomfortable! Unfortunately there are no pictures of the inside of the church as photography was not allowed. When we first came into the church the groomsmen gave us each a white rose for our buttonholes/dresses which was a lovely touch. 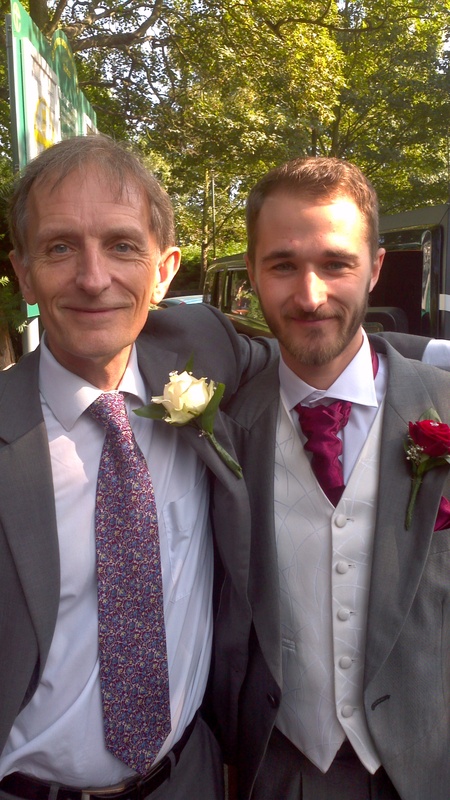 My cousin Fred, Laurence’s brother, was the best man during the ceremony (he and the oldest brother, James, shared best man duties with Fred filling the role at the church and James filling it at the reception). All of the men in the bridal party (including Tristan) looked splendid in grey morning suits with dark red flowers for the buttonholes. Katie’s younger bridesmaids were wearing very cute dresses with dark red tops and white organza skirts which I believe were made by some of Katie’s family. Her Maid of Honour (which is apparently an American term?) was wearing a dress of the same red. Her dress was tight to mid-thigh and then flared out. It suited her figure very well and looked great when she was dancing. Katie’s dress was of course the main event, as it should be. She had a beautifully long train and skirt with lots of layers and small crystals sewn in. The top was a corset style, sleeveless top again with lots of sparkles. With a long veil and her grandmother’s tiara to top it off Katie looked every bit the glowing bride. Beautiful. 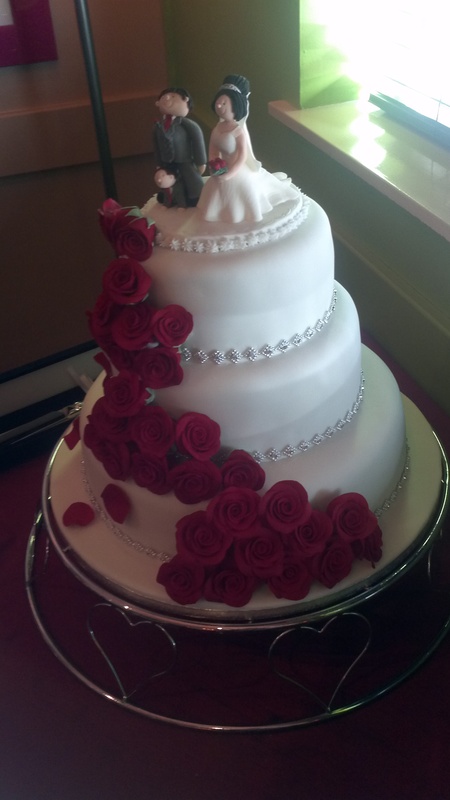 Her bouquet was of red roses which matched the men’s buttonholes and the bridesmaids’ dresses. The ceremony itself was lovely. I know all of the women in my part of the family had tears in their eyes when it came to the vows! It was an honour to get to share such a precious moment with my cousin and his new wife. After the ceremony there was the traditional throwing of the bouquet, which was un-traditionally caught by the bride’s mother! Laurence and Katie also chose to release doves as a symbolic gesture of their love along with one for Tristan showing their love for him. And now we finally have pictures! My cousin James and my father James. 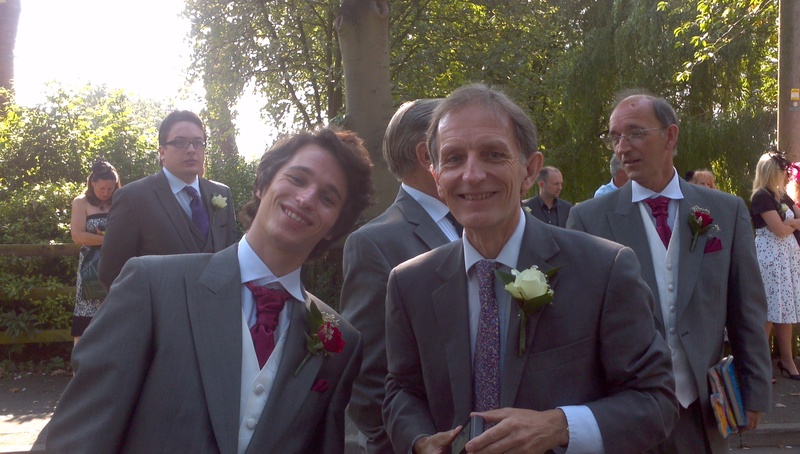 Also Chris on the left looking very serious and my Uncle Pete, the father of the Groom, on the left. My dad and my cousin Fred. 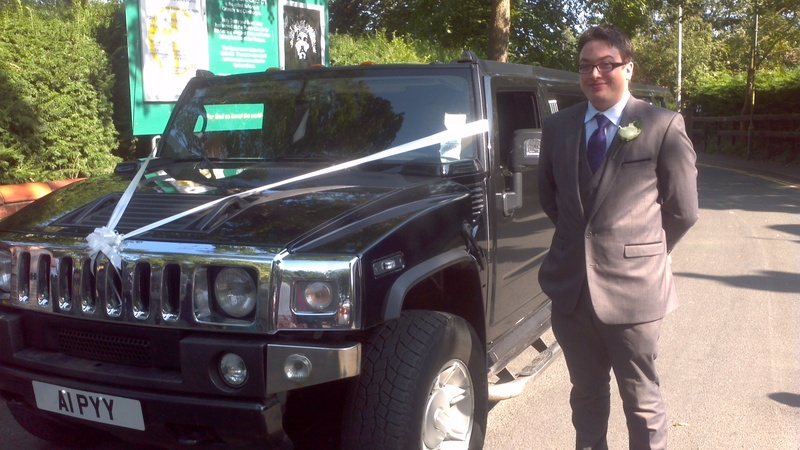 Laurence and Katie had a heck of a get away vehicle. The meal reception was held at The Old Coach House. Starters was a choice of melon, prawn cocktails, tomato soup or chicken liver pate. 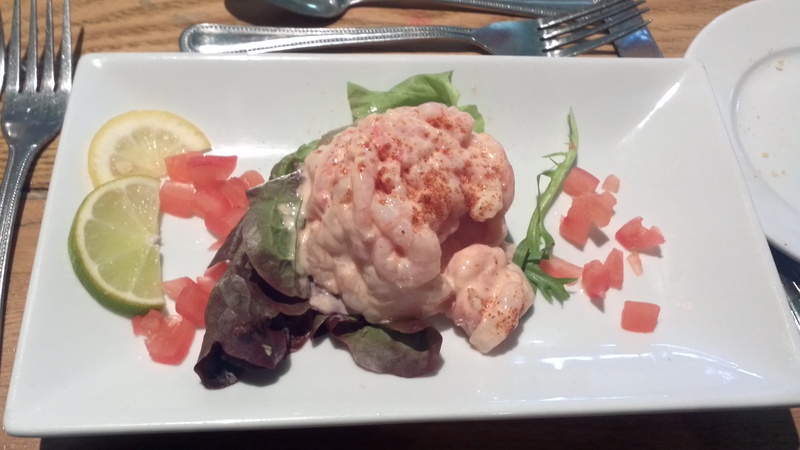 I chose the tomato and Chris had the prawn. I heard the melon with rhubarb and mint compote was very good although the pate was a little runny. 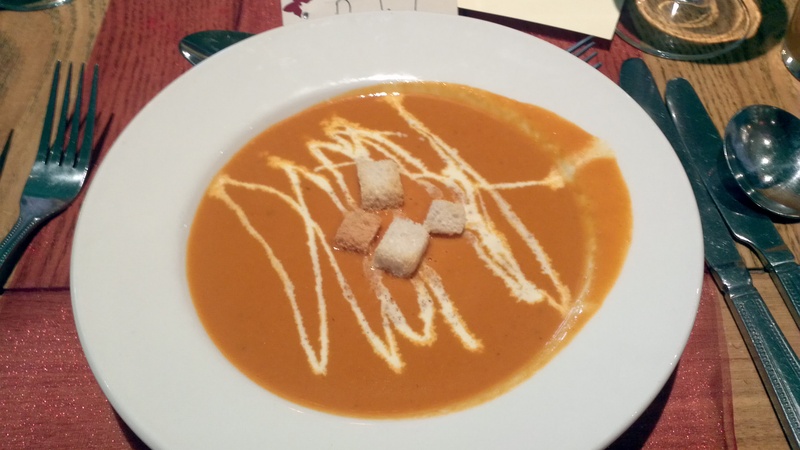 The tomato soup was delicious, I would go so far as to say it was one of the tastiest tomato soups I have had. The main course was a choice of Salmon, Chichen with mushroom, Vegetable Wellington or 21 day aged Beef. Everyone at our table had the beef except for me, I had the chicken. However my Mom said she enjoyed her Salmon. I’m not sure if anyone had the vegetarian! 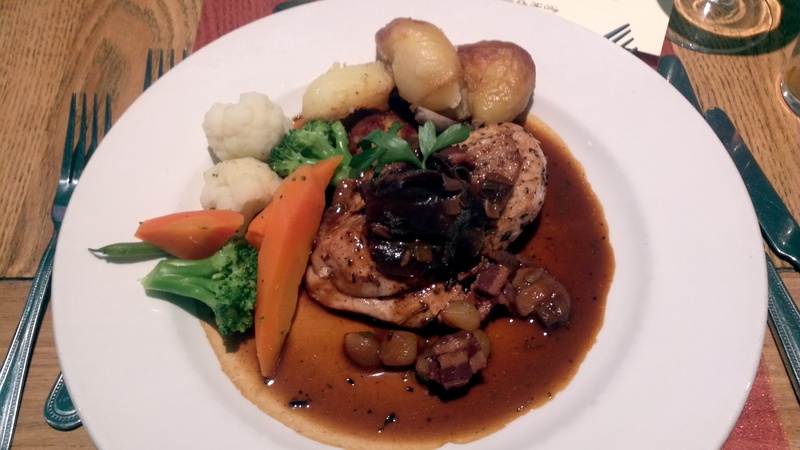 Supreme of Chicken Forrestiere with wild mushrooms, smoked bacon & thyme jus and baby onion compote. Roast sirloin of 21 day aged beef hand carved and served with rich stock gravy. 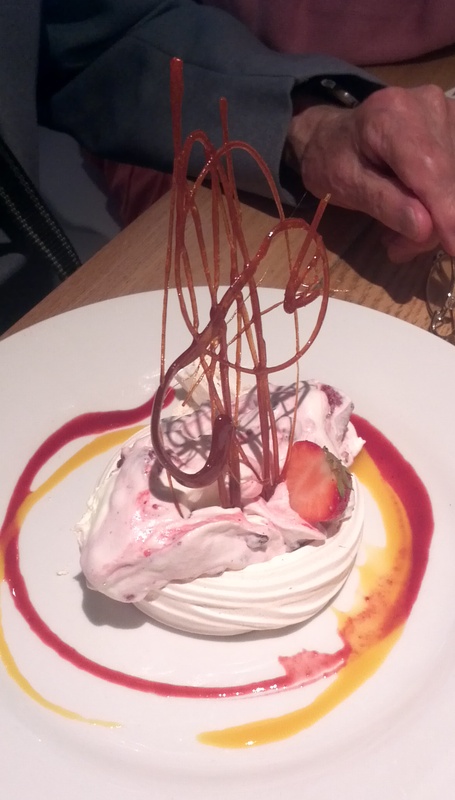 Dessert was a choice of profiteroles, ice cream, strawberry cheesecake or forest fruit pavlova. The cheesecake was a perfect balance of sweet and tart, delicious, but the pavlova definitely stole the show on presentation. And a few detail pictures. Chris bought me a Cosmopolitan with a sparkly stick! Aunt Coralie’s top tip: Write each person’s food choice in the place setting so people remember what they ordered! 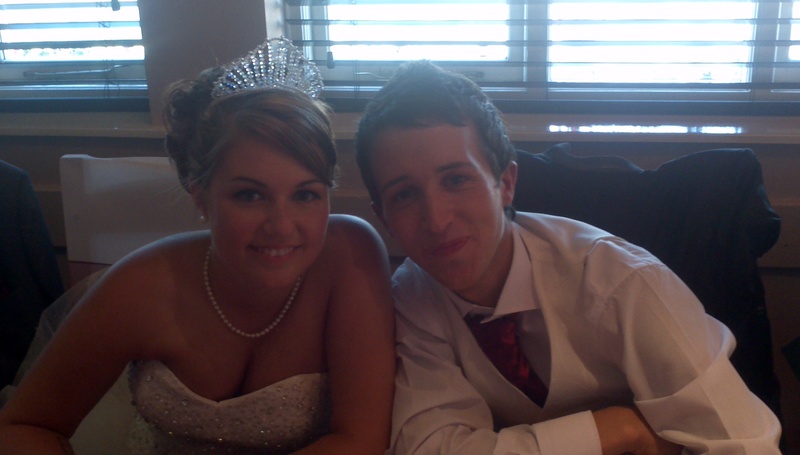 Laurence and Katie at the top table. The evening reception was held at the Constitutional club in Cleethorpes which has a good sized dance floor and a cheap bar. What more do you want? A buffet was served there but in all honesty we were all still pretty full! The cake was also served there. 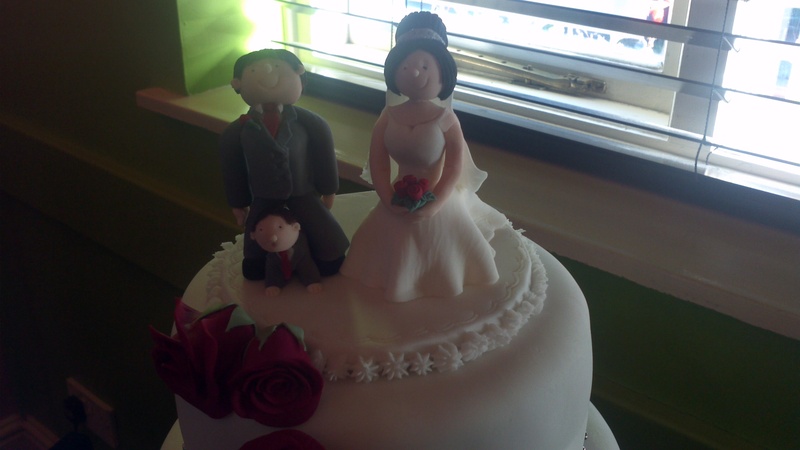 The cake was also made by relatives of Katie. 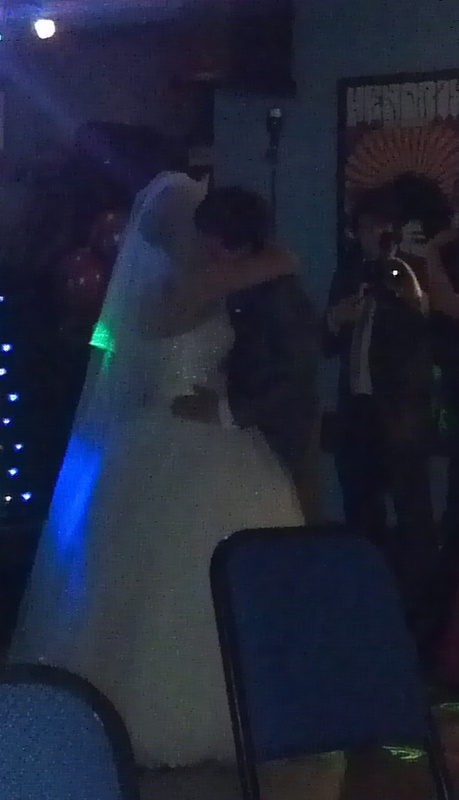 The first dance was lovely, it was clear just how in love they were. It doesn’t come out well in photo because of the lights but you can get the idea. 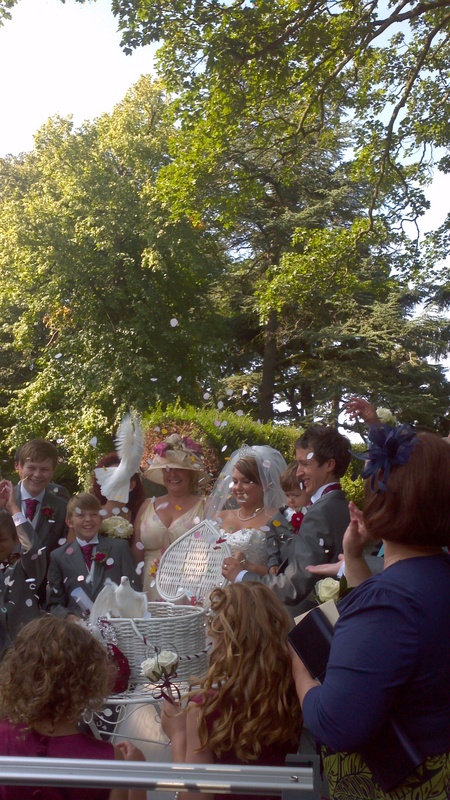 All in all a lovely day and I know Katie and Laurence had a great time too. It has been wonderful to see how exciting they have been finding their first week of marriage as well. The joys of Facebook updates :). I hope they have many, many happy years together. And it is good to know there is a new Hudson woman just as I am about to become a Hardman. “Had a brilliant time. 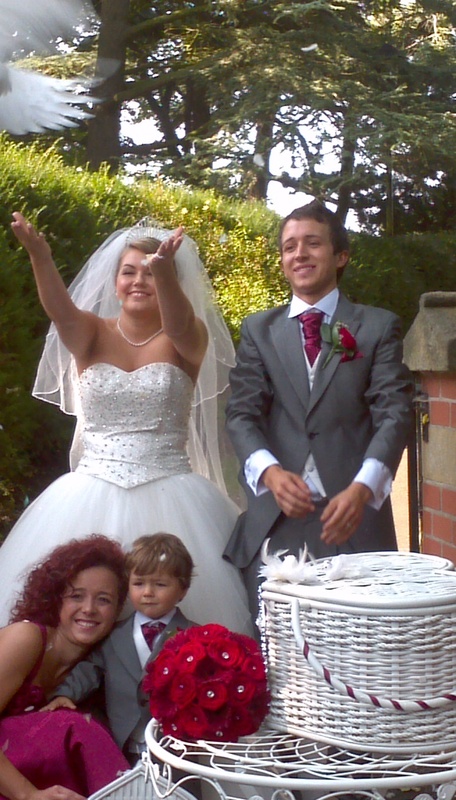 Katie and my Cousin Laurence looked wonderful, my Cousin Tristan looked so cute and Tristan looked so grown up. 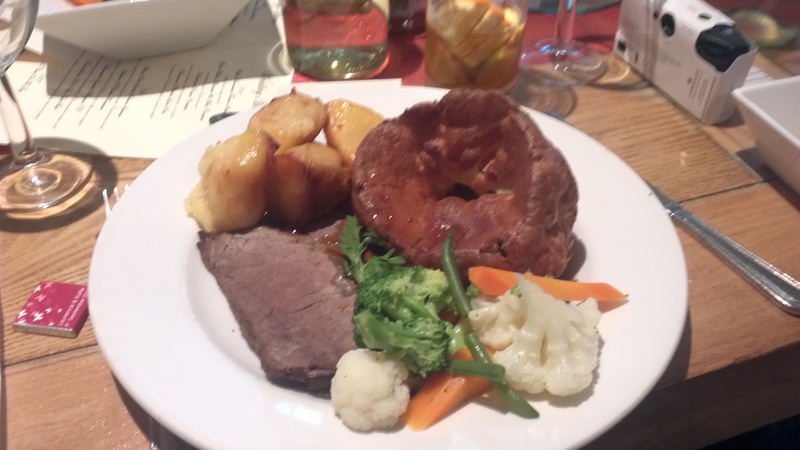 The food was brilliant at the Coach House. The speeches were beautiful. I hope that Katie and Spud have a very, very happy Marriage. Everyone looked lovely and were very friendly. I loved the Wedding out-fits. Katie’s dress and Laurence’s Morning Suits looked wonderful. It is definitely wedding season. A few days after I got engaged a friend’s boyfriend also popped the question to her. Then there are the two weddings that are actually taking place this September. Yesterday Kim went to her boyfriend’s brother’s wedding and next weekend is my cousin’s wedding (yes there will be plenty of pictures!). All of this means wedding shopping! 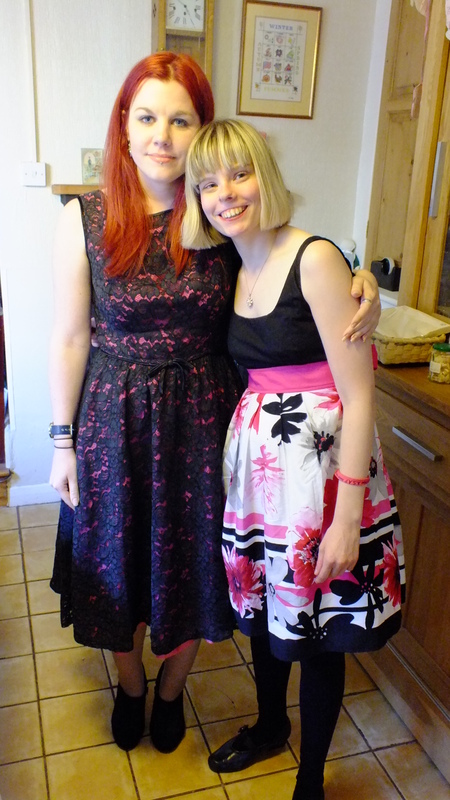 A few weeks ago I got a lovely black dress with pink and white flowers specifically to wear to Laurence’s wedding. Kim has a lovely grey dress she was going to wear to Kieran’s brother’s wedding. Dresses sorted accessory shopping was the order of the day. In TK Maxx we found two great handbags and I bought a lovely pair of shoes that go with my dress perfectly. You can see the pictures of them next week! We spent the rest of our shopping trip searching for fascinators and boy are they hard to find! We did find some but they were always in limited colour schemes or really, really expensive. In the end we gave up and went to lunch. 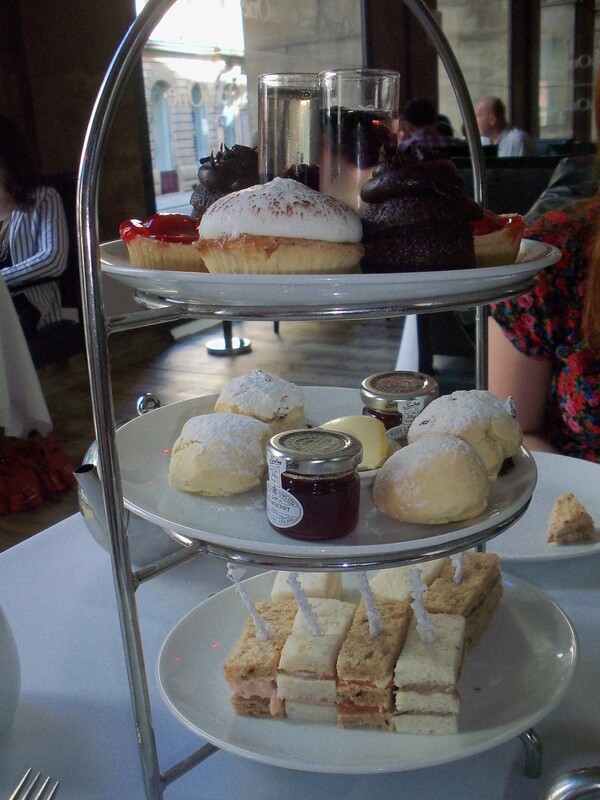 Kim and I do love a high tea and in celebration of my engagement (see how I worked that in there again?) she took me to lunch at Opus One in the Raddisson Hotel on Peter Street. We sat in the more open part by the big windows so that we could people watch. Dressing up was of course a must for such a posh hotel. I love the vaulted ceiling and red globe lights. Image from the Raddisson Hotel website. We ordered the classic high tea. 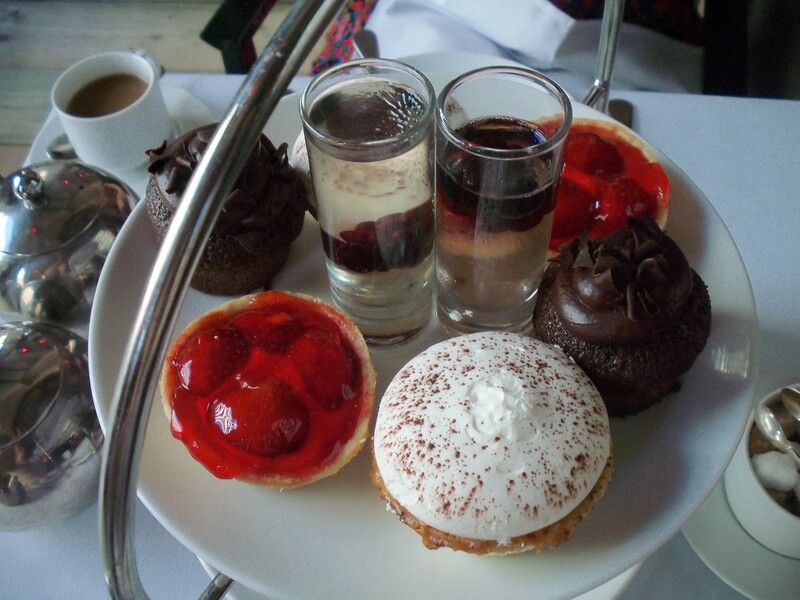 They also do a champaign high tea and a gentleman’s high tea. The gentleman’s high tea features things like pie and real ale, I think it’s a cute idea and hopefully means more men will take their ladies out for something fancy. The sandwiches were very good, I particularly enjoyed the beef which was very flavoursome and fresh. The selection also included cheese, egg mayo, ham & mustard, prawn, tuna and salmon. The scones were delicious although Kim and I both agreed they were on the small side. We also felt that one curl of cream between two people was very stingy. We each had one sultana scone and one plain. The creamy pie dessert which Kim and I initially thought would be a meringue turned out to be banoffee with a lot of cream on it. Since I love banoffee I really enjoyed this dessert although it was incredibly rich and I had to take it slowly! 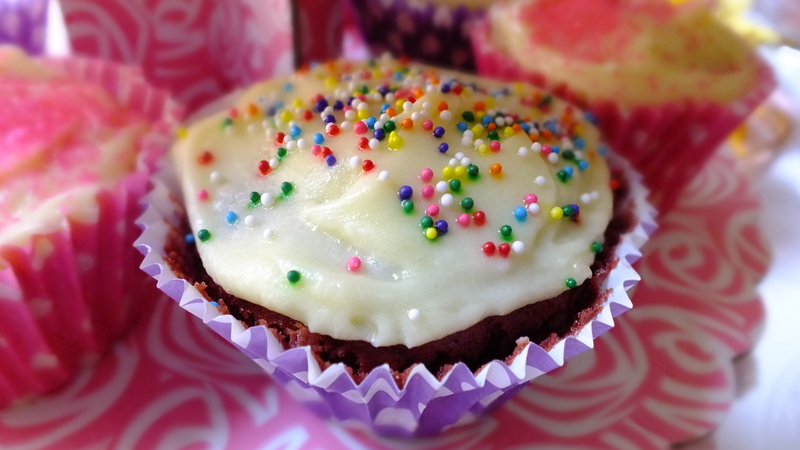 The third dessert was a chocolate cupcake with a Betty Crocker style icing top. Again it was very sweet, although a little dry. I just ate each bite with some icing and it was very good, who doesn’t love chocolate?! 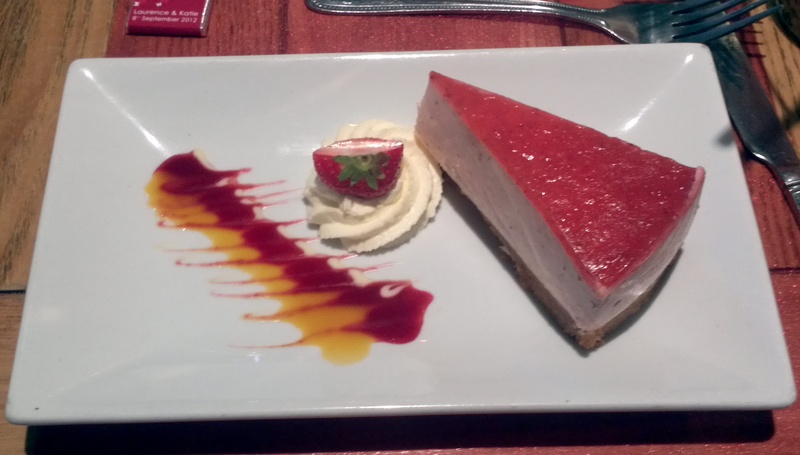 My favourite of the desserts was the strawberry tart. The blend of sweetness with the slightly tarter strawberries worked perfectly and the pastry was crumbly and sweet, excellent! The tea was, of course, delicious…it was tea! While we would have preferred the white tea pots and tea strainers we had previously at Opus One it was still loose tea which I approve of. Overall I had a lovely day out with Kim discussing weddings, politics and shoes. Thanks for lunch Kim! One of the advantages to being bi-national is that you get two sets of holidays! Maybe it isn’t politic to have a party celebrating American Independence in Britain and invite my British friends but we have fun and everyone gets pie! Actually since I missed the Jubilee due to my boyfriend being in hospital we put up the British flags as well as American. 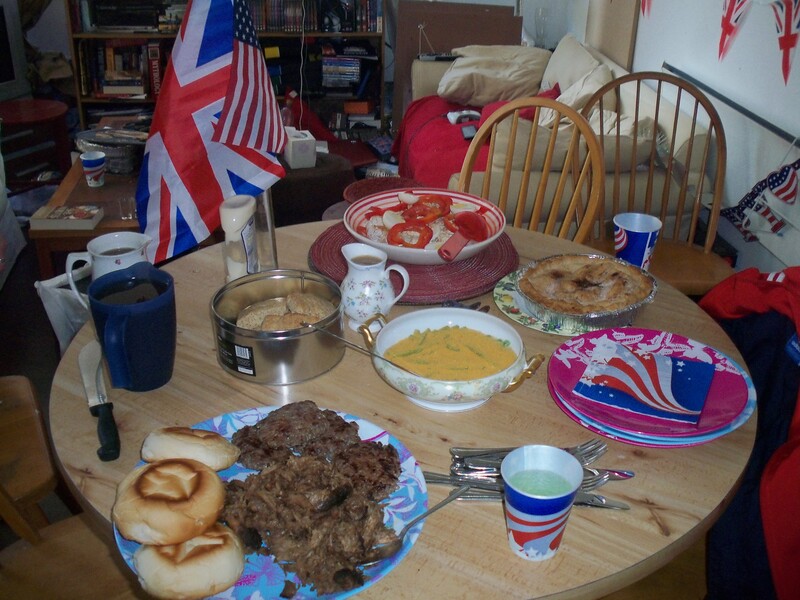 Kim and I made an eclectic mix of American style foods that you can actually make in England. 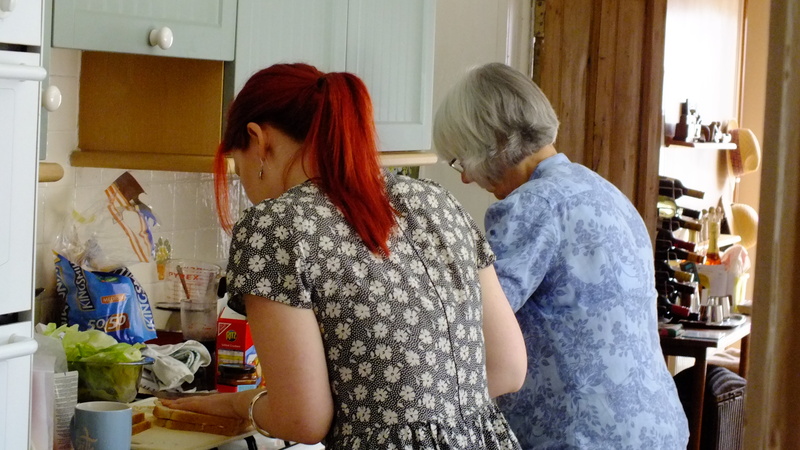 She and her boyfriend brought over biscuits with gravy and pulled pork, which was delicious! Check out Kim’s site for her entry on the pulled pork. I think The biscuits were whole-wheat which was new to me but definitely works. I love how my half English, half Scotish/Irish best friend and her completely Irish boyfriend will not only come over for an American party but will even contribute. I made hamburgers, potato salad and green beans in mushroom soup. My potato salad is an odd thing since Chris and Kim both love it but neither of them actually likes potato salad :s This either means my potato salad is very good or not very much like potato salad. I have had people who do like potato salad also enjoy it in fairness. 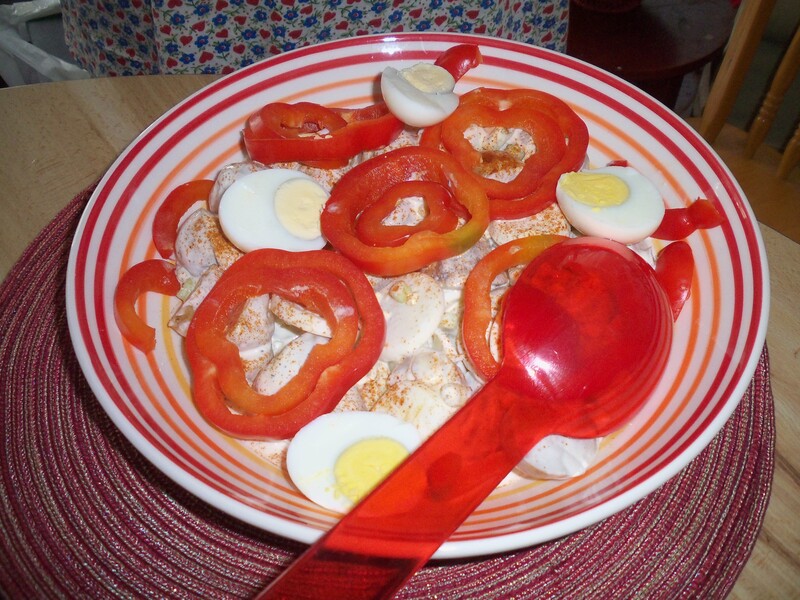 This potato salad consists of cooking up some new potatoes and hard boiling some eggs and then chilling them. Water down some mayonnaise and mix into it the chunked potatoes and eggs along with some chopped spring onion and red pepper. Chill again and eat! Since last Saturday (yes we had July 4th on July 7th) was one of the few sunny days we have had this month we decided to take a blanket and head to the park for dessert. It wasn’t actually warm and as soon as we got there the sun went behind a cloud but, in true English style, we made the best of it! We discussed Star Wars, teenagers and late-20s then read our books and enjoyed the lack of rain! We also had apple pie and cream (which I promptly managed to tip off of my pathetic paper plate). Mom said cherry is traditional but since Kim doesn’t like cherries, I prefer apples and, moreover, I have a recipe for this one, Apple Pie it was! 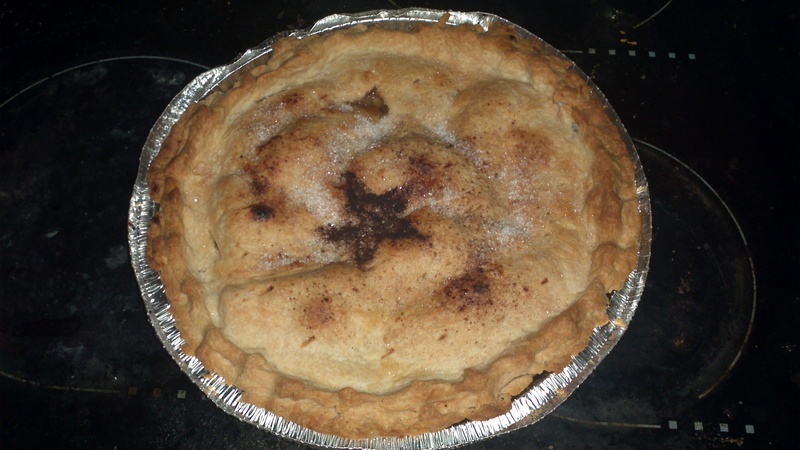 This is the apple pie my Mom always makes for Thanksgiving, which was made by her mother as well. I love baking but I always particularly enjoy making Grandma’s recipes. I feel close to both my Mom and my Grandma even though they may be very far away. Mom’s aim with her pie is always to see if it tastes like Grandma’s. Mine is to see if it tastes like Mom’s. I hope both of them would approve of this pie! The biggest baking compliment I have ever had was when Mom told me I make candy cane cookies as well as Grandma. So here is the apple pie recipe as sent to me by my Mom. Mix the ingredients together. The dough should form into a fairly solid ball. Roll out on a pastry board. Use additional flour to cover the board and the rolling pin. Combine the first 4 ingredients in a bowl and place into the raw shell. Put the pats of butter on the top. Add the top crust if doing so. (I often find it necessary to cover the crust so that it doesn’t burn and then take it off for the last 10 minutes or so to allow the crust to get a nice golden brown. I have to say, I think it turned out well! Especially the crust, I brought Crisco back from the States 2 months ago so I could make it properly. There are a lot of things that they should definitely sell in England! Mom and I always stock up on baking goods when we go home. So that’s how we celebrated 4th of July in England with only 1/8 of the group being American! And 3 days late! But with a lot of fun and a great appreciations for the freedoms we have, which ever country we’re in.